Do you feel like you have hit a plateau in your spiritual journey? You’re not alone. Wellspring invites you to take an intentional year of soul deepening practices. Wellspring cohorts being in the August through May each year. Wellspring is a ten month small group experience focused on spiritual deepening. At its heart are five interlocking practices that act as invitations to depth. Wellspring is an intensive experience which needs a more intentional process to assess readiness and commitment. Because of limited space we want to prioritize leaders who may feel like they have ‘done it all at church’ or need a sabbatical year from ‘church work’. Wellspring is a nine-month deep dive into the six sources of Unitarian Universalism and an opportunity to plumb their depths for what they might mean for our own spiritual journeys. This year, because of Wellspring, I have attended vigils for reproductive justice, I have asked myself who is my neighbor, I finally volunteered for Faith Family Hospitality, I have looked into the faces of homeless men and smiled, and I have prayed. A lot. Wellspring has provided an opportunity for me to grapple with and consider who I am as a spiritual being. I began the class, preparing myself for tedious reading and stressful stolen moments to complete the biweekly homework assignments. What I found was deep enrichment and growth from various religious practices; more clearly defining my own and sharing my thoughts with a small trusted community. It has opened up parts of my life that have needed tending, and allowed me to share some of those parts and pieces in a very safe and authentic way. Wellspring is one of the best programs I’ve participated in during my 15 years at Foothills. One of the first steps in the Wellspring program is to find a spiritual practice you can commit to on a daily basis. 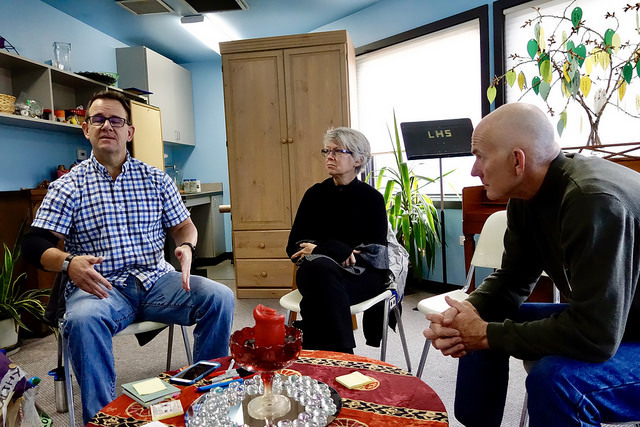 Your Wellspring group members support your intentional spiritual practice and explore with you how UU history and theology and wisdom from other religions can enrich your life and connect you to your true self. This program is a gift. Ready to dive in? Applications will be accepted till early May.